UAVs can be assigned different tasks such as e.g., rendez-vous and space coverage, which require processing and communication capabilities. This work extends the architecture ROS/Gazebo with the possibility of simulation of co-operative UAVs. We assume UAV with the underlying attitude controller based on the open-source Ardupilot software. The integration of the co-ordination algorithm in Gazebo is implemented with software modules extending Ardupilot with the capability of sending/receiving messages to/from drones, and executing the co-ordination protocol. As far as it concerns the simulation environment, we have extended the world in Gazebo to hold more than one drone and to open a specific communication port per drone. 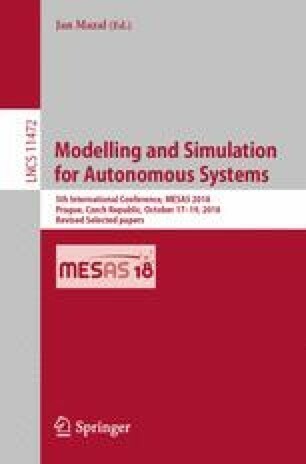 In the paper, results on the simulation of a representative co-ordination algorithm are shown and discussed, in a scenario where a small number of Iris Quadcopters are deployed.